Thick layers of pound cake or angel food cake are filled with rich pineapple cream for this easy pineapple cake. Only five ingredients and ten minutes! I love long complex cooking projects – sometimes. I also have a busy eight month old son and a crazy life and piles of laundry that come around day in day out. Sometimes I NEED dessert and dessert needs to be simple! Lacy is also a very, very, very good friend so she handed over the recipe and gave me permission to share it. I literally tossed it together in 10 minutes. You just can’t beat that for easy dessert! I know it is kind of more of a spring and summer dish but I was not waiting six plus months to share it with you all. 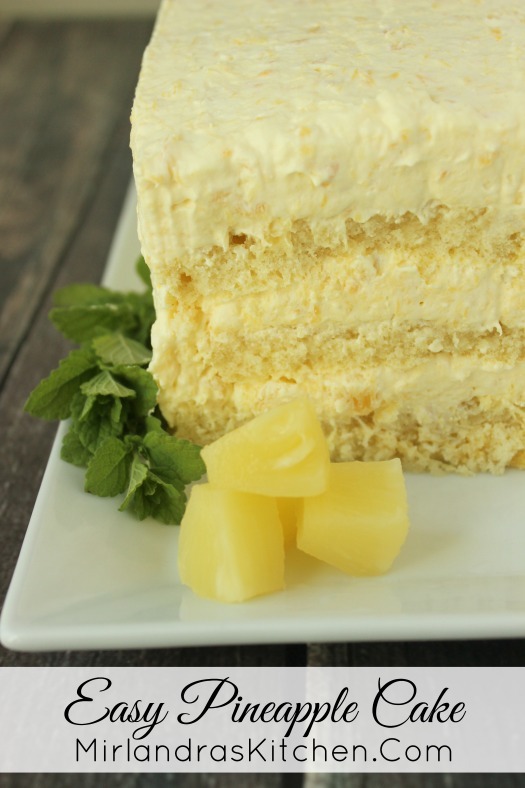 Those of you who have been around the cooking block a few times might recognize this recipe as Dole Golden Layer Cake or Pineapple Dream Cake. The recipe is probably original to Dole. Wherever its origin, try to find 10 minutes to whip one up before you get totally lost in pumpkin and apple and Halloween candy. Trust me; it is more than worth it! Tools In This Post: The Amaretto flavor in this cake is perfect and not to be missed. If you don’t want to use alcohol, this syrup is a good substitution. Love Pineapple? 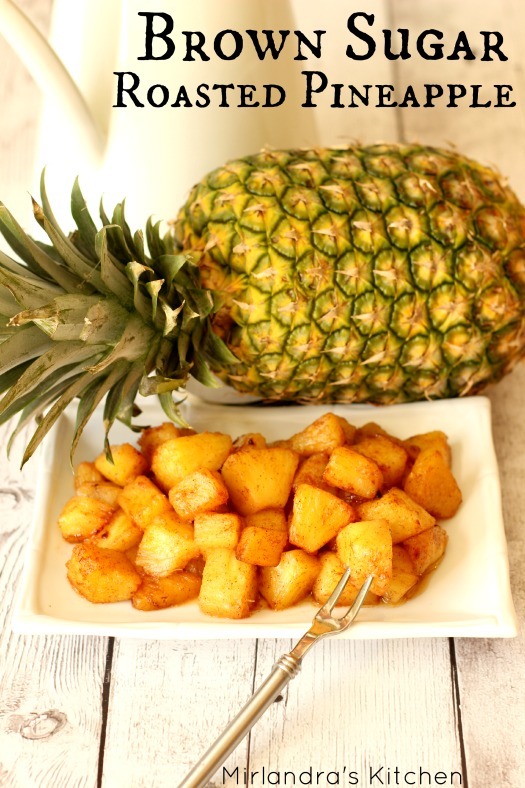 Don’t miss one of my all time most popular recipes for Brown Sugar Roasted Pineapple! In a medium bowl combine the pineapple with all of the juice, the pudding and the cool whip. Stir with a spoon until well mixed. Let the mixture stand for five minutes. Cut cake into three layers and brush with amaretto. Divide the filling between the layers of cake and on the top to create three layers of filling. Garnish as desire and refrigerate until ready to serve. YUMMMM! I am so glad you didn’t wait to share with us at Weekend Potluck. This looks delectable. Thanks – I was SO glad Lacy shared it with me! This looks amazing! And the fact that it’s so incredibly easy to make just take it to a whole new level! I like these lazy recipes that look over the top! Miranda! You did it again. Received Most Clicks at this week’s Weekend Potluck party. *-* Way to go Girl. Thanks for sharing your amazing dishes with us. Hope yours is a wonderful weekend. Wow! I feel so honored. It is always special to have people enjoy the food we love so much in our home. Thank you for all the work you put into hosting Weekend Potluck! Is there a substitute for the Amaretto liquor? Yes there is! If you look about midway through the post there is a kind of Amaretto syrup I suggest if you do not want to use the alcohol. It is available on Amazon if your local grocery does not carry it. Happy cooking! Don’t want to use Cool Whip, would this recipe work with Whipped Cream? That is always an interesting question. I have not tried it so I can not say for sure. I think it might though. If you were going to do it I would make sure you use a whipped cream recipe that used powdered sugar or no sugar. Using granulated sugar makes a less soupy mixture. If I was going to try it I would just whip the cream with a pinch of salt and a bit of vanilla and then stir everything in. If it tasted like it needed sugar I would sweeten to taste with powdered sugar. You could also try adding a few Tbsp. of cream cheese to the cream while it was whipping. That would probably make a big difference to stabilize it. I am very curious! If you try it please let me know how it turns out! Do you make the pudding before adding it as an ingredient or do you just put the pudding powder in the mixture? Nope, just toss the powder in there. I hope that makes sense! Have made this with pound cake, minus the liqour, and it was amazing! Am making it tomorrow for Christmas day. Only change is this time I am using angel food cake instead of pound cake. Hoping for good results this time. I much prefer pound cake to angel food cake. Thank you for sharing this amazing recipe! For an even more tropical taste try using instant coconut cream pudding. Oh that sounds excellent! Thanks! Hi, Just discovered this recipe. Can I substitute a yellow cake mix for pound cake or angel food cake? Thanks. You certainly can. It is a bit different but will still be wonderful! Hi, so you throw in the powder and is the whip cream also just thrown in, or do you whip it? Hi Sara – thanks for asking! This recipe calls for cool whip that is already whipped so you would not need to whip it. However, if you wanted to use heavy whipping cream you would need to whip it first. I have not made the recipe with heavy whipping cream but I would suggest whipping it up with gelatin to make it stabilized. I have instructions here that show you how to do it: https://mirlandraskitchen.com/whipped-cream-frosting/ This recipe is enough to frost an entire cake but since you just need 8oz for the Pineapple Cake you will need to measure out 8oz of the stabilized whipped cream when you are done. It should look like the amount you would have in a tub of cool whip. Let me know how it works for you!